The AIREX Coordination Pad is a sensible addition to the AIREX Balance-Pad for more variety and more training possibilities. The AIREX Balance-Pad Plus and the exercise programs from the Institute for Fitness Education allow for maximum training effect with minimal exhaustion. In the areas prevention and rehabilitation, they effectively train motor functions, endurance, coordination, strength, equilibrium and promote proprioreceptive training. The AIREX Balance-Pad Plus can be used in numerous ways. The positive effect is based on the destabilizing characteristics of the specially developed material and its form. The physiologically optimal, three-dimensional wobble effect is easy on the locmotor system and enhances the training effect. AIREX Balance Pad Elite In stock! 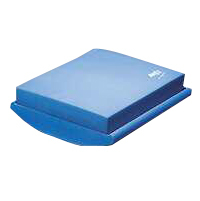 AIREX Balance Pad XLarge In stock!